We saw the Chuck D-centric Olds 98 in Toronto a couple weeks back, and now the Canadian contingent is back with a whole bunch of seriously rare machines for our enjoyment. 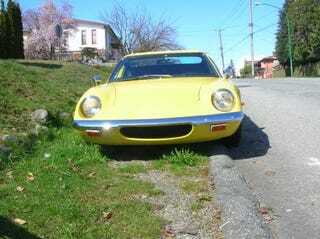 Donkeyassman has spotted a Lotus Europa, Lotus Elan, Chevy Chevelle, Mazda Eunos, and a pair of Honda Beats in the city of Burnaby, B.C. So put on your tuques and make the jump for many more photos and Donkeyassman's description. Suckers To The Side, Ontario Hates My 98! I took some pics of these 2 sweet lotuses and some other cool stuff in my area - Burnaby just outside vancouver BC .. There is a mazda eunos and 2 honda beats at that one guys house.. He must do some importing I guess.